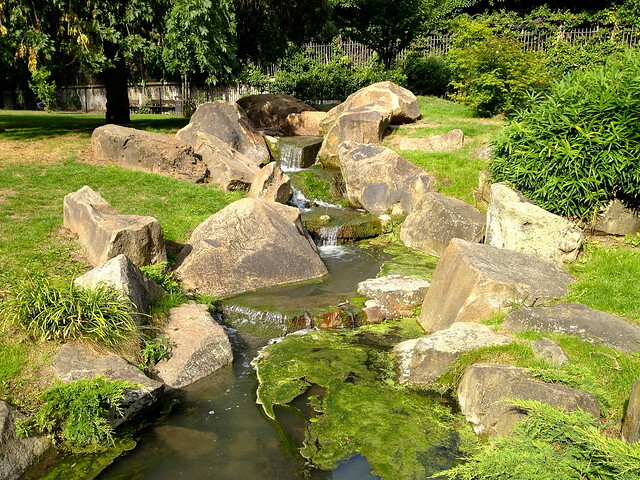 There are two well-known Japanese Gardens in London – the Kyoto Garden in Holland Park and the Japanese Landscape, with the Chokushi-mon at its centre, in Kew Gardens. 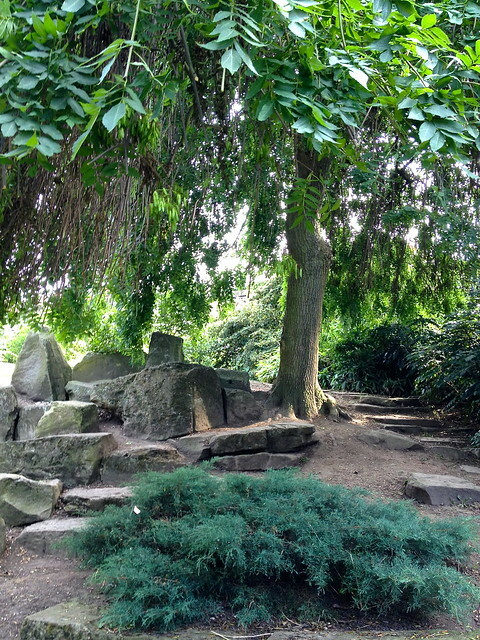 I’ve written about both of them before, but today I want to tell you about a third one that you’ve probably never heard of – the Hammersmith Park Japanese Garden, which has some unusual features. 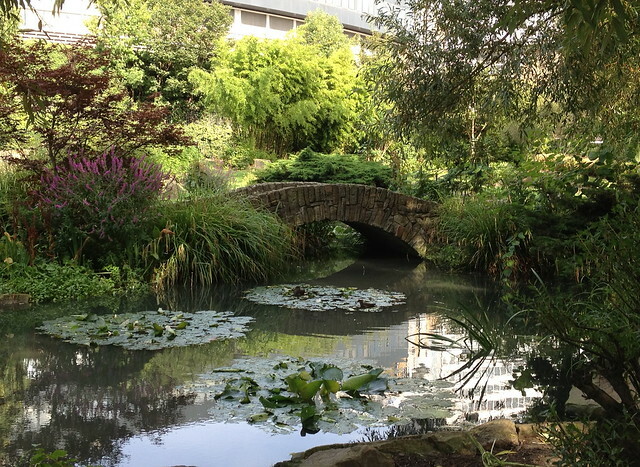 For one thing, it’s the oldest traditional Japanese garden in a public place in Britain. 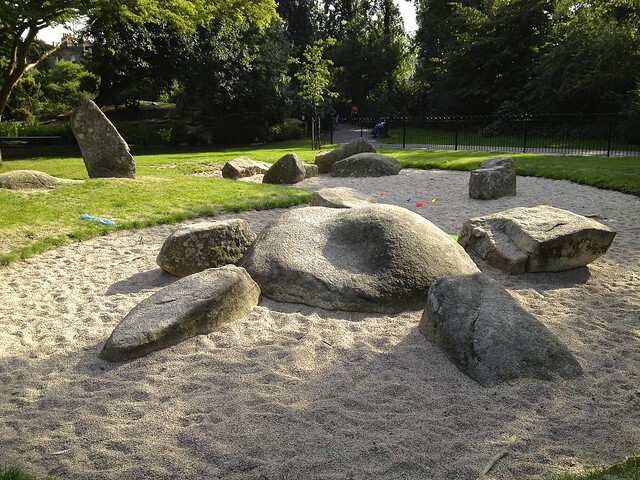 And for another, it’s completely integrated into Hammersmith Park as a place where children can play and their parents sit on shady benches to watch them, with none of the formality you see in other Japanese gardens. How does it come to be there? Well, it’s all that remains of a much larger garden which was one of the main attractions of the Japan-British Exhibition at White City in 1910. (I’ve got more to say about this exhibition, but I’ll save it for a later post). The exhibition garden was as authentic as possible with traditional pavilions and bridges; all the plants used were brought over from Japan. 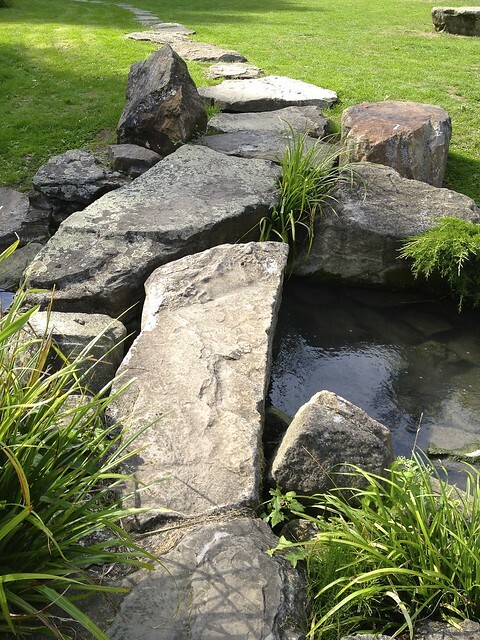 Water played an important part in the garden, with extensive pools and cascades created from puddled clay between blocks of stone from Derbyshire and Devon. Japan-British Exhibition, White City, 1910. Image property of Hammersmith & Fulham Archives. Sadly, everything was dismantled when the exhibition ended in October 1910, though the garden survived until the 1950’s when the original ‘Garden of Peace’ was partly demolished and reconfigured in a non-traditional style. 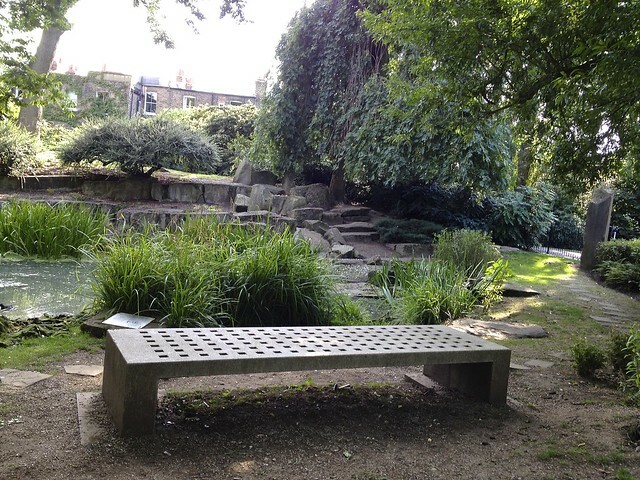 In 2010 Hammersmith and Fulham Council commissioned a restoration of the garden by Japanese landscape architect Yoshihiko Uchida and engineer and traditional Japanese Garden expert Satoru Izawa. They returned to the traditional emphasis on the configuration of rocks as the heart of the garden. 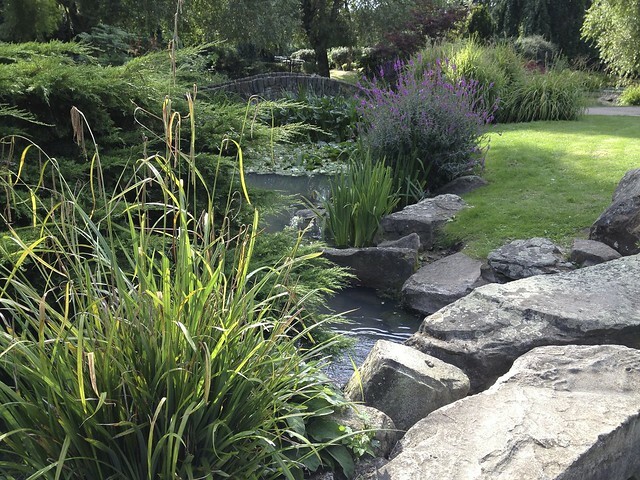 The garden is designed to be a place of quiet contemplation and reflection, with cascades and a meandering stepping-stone path that draws you through the landscape. There is a ‘forest’ area, planted with ferns and shade-loving grasses along rhododendrons and azaleas that bloom in the spring. 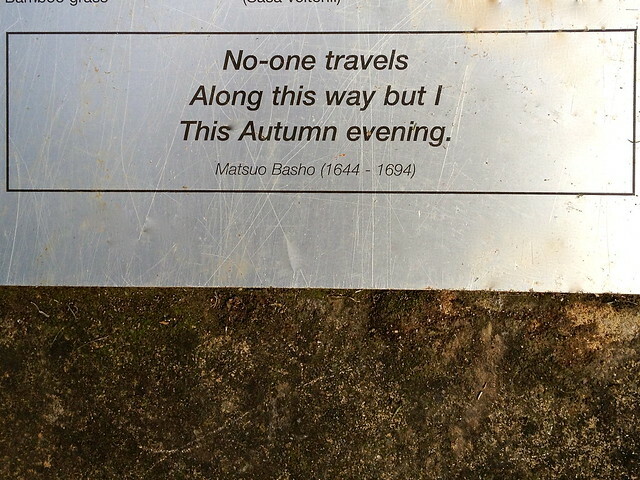 At one entrance they’ve placed an engraving of one of Basho’s haiku. 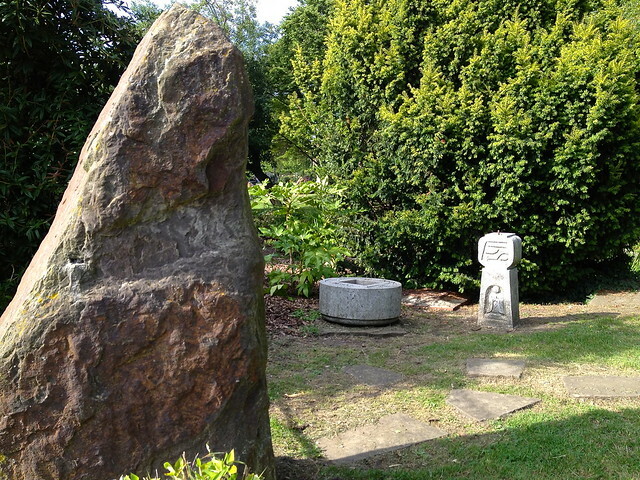 At the other entrance are standing stones and a stone basin. It wouldn’t be a Japanese garden without a dry garden. This one is based on the story of the crane and the turtle and their voyage to the island of eternal happiness. The garden is a metaphor for a child’s journey though life and the wish for it to be happy, so the dry garden is not formally raked – instead it’s used as a children’s play area. I visited the garden on a quiet evening in later summer, and it was lovely to sit on one of the stone benches by the ‘beach’, where the pond represents a rocky sea shore, and contemplate the water. If youre thinking of visiting this unusual garden, the nearest tube station to Hammersmith Park is White City on the Central Line. This entry was posted in Japanese Gardens and tagged 1910 Japan-British Exhibition, gardens, Hammersmith Park, London, plants by Fran. Bookmark the permalink. It’s a beautiful garden. Such a shame it’s a rainy day today. I’ll visit it tomorrow! Very nice!! The “forest area” photo doesn’t look too Japanese (!) but it’s nice they took the trouble to restore! I’m sure they did their best with what was available! Superb, thank you so much. I worked in the area for years & never realised! A return trip it is! 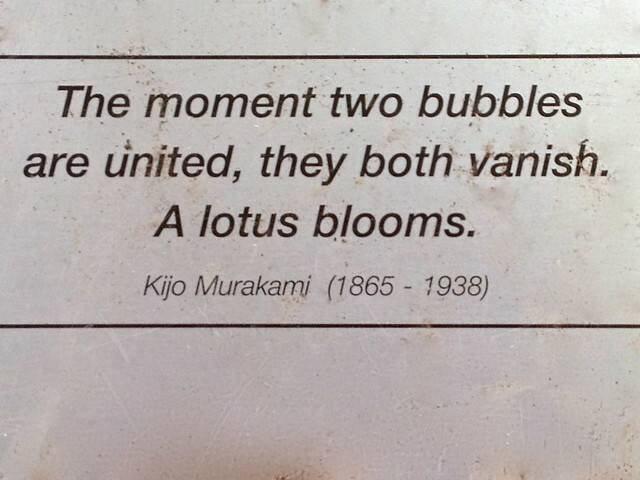 It’s because it pretends to be just an ordinary park – you have to actually go in to find the Japanese bit. I’m glad you like it – it’s not very well known. I was one of the volunteers that helped to cut back all the overgrown plants and weeds a few years ago. It was a fun couple of days, and it was nice to be involved with something like this. I’m glad they’ve gone further and transformed it into what looks like a really nice garden. I’ll have to try and visit it again, as I haven’t been back since then. I liked it very much and there were plenty of people out enjoying the peace and quiet – so all your hard work paid off! I just stumbled across this having stumbled across the garden this morning…thank you for an informative and enjoyable blog post! I’m glad you found it useful. It’s such a little-known garden!